Best Buy always has their clearance, refurbished, and open box store open, but right now they’re promoting a sale with up to 40% off items until April 28. We haven’t seen a significant drop in price on all items, but here are a few deep discounts you might want to check out. First off, they’ve got a pair of Beats by Dr. Dre Powerbeats “Geek Squad Certified Refurbished” black wireless earbuds for $74.99 (List: $199) for a $125 savings. They’ve also got the Flash Blue and Shock Yellow color versions for $79.99, as well as plenty of other Beats headphones and earbuds discounted. 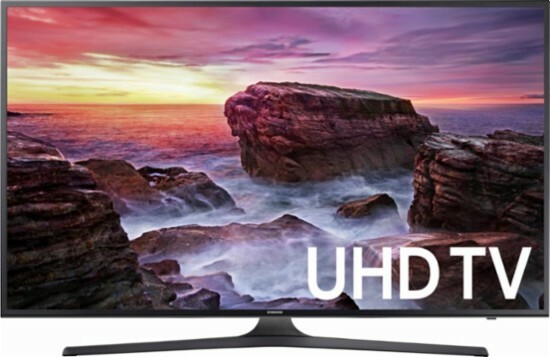 Among the discounted 4k TVs is a 65″ Class Samsung 4k Smart TV (model no. MU6070FXZA) with LED display technology, 2160p resolution (unfortunately no HDR support) and Motion Rate 120Hz. That set is priced $729 (List: $1,099) for a savings of $370. If you’re looking for a deal on an Apple Watch, Best Buy has got plenty in their refurbished store. Take for example the Apple Watch Series 3 Space Black Stainless Steel 42mm size watch face with GPS and Cellular capabilities. That watch has been marked down to $539 from $649 for a savings of $109. In addition, there’s an In-Store Coupon to get an extra 50% of open-box luxury appliances — which might be the most valuable discount in the whole promotion. You just have to bring it in-store. Jump over to the Best Buy Outlet to check out the prices for yourself.